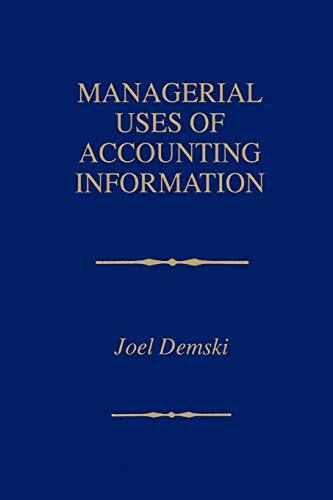 Managerial Uses Of Accounting Information: 9780792398479 Paperback - LIMEROCK BOOKS INC. Professor Demski has focused on disclosure incentives and optimal contracting. Professor Demski has served on the faculty of Columbia University (1967 - 68), Stanford University (1968 - 1985), and Yale University (1985 - 1994). He has been recognized a number of times for Outstanding Research and Education and received an AAA Seminal Contribution Award in 1994. Professor Demski is noted as one of the most widely published authors in the field with over eighty articles published. Honors and Grants: Honorary Doctorate, Odense University, 1994; AAA Seminal Contribution Award, 1994; Elm-lvy Award, 1989; AAA Outstanding Educator Award, 1986;AICPA Award for Outstanding Contributions to the Accounting Literature, 1967 and 1970; Notable Contribution to Management Accounting Literature Award, 1996; University of Florida Foundation Research Professorship (2000, 2002); Accounting Hall of Fame, 2000; President, American Accounting Association, 2001-2001.